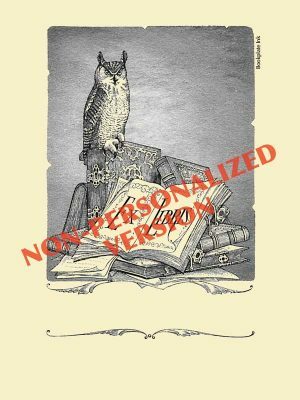 Introduced in the late 1940s, this owl design was adapted by the Antioch Bookplate Company from a steel engraving designed and originally published by William Pringle. It is one of our most popular designs. The “ex libris” text in the open book means “from the library of.” This version is available only with no text added. If you would like to have a name printed, please see our personalized version.